Where do I possibly start with this one? So as Duke continues to care for the 'Wallington Panther' a.k.a his sisters physco cat Alan, that seems to be causing him more and more problems on a day to day basis,...and well, whats more, the silly twonk dropping his phone down the khazi today, to be left with a half functioning HTC. He really hasn't had much luck with his phone so far this season, what with leaving it in a cab in Staines and on charge in various boozers on away days. "Anyone seen my phone". What a tool! Evidence of Duke's tool-ish behaviour can be found here and that for me has to be one of this years highlights of away day carnage. Seeing as 'ol Duke has given you a recent run down of his recent day to day life events, It's only fair and just, that I do the same. Well this years team cycling, has come to nothing before it even began. So yeah the cartilage and tendons in the trusty left knee have yet again decided they no longer like being attached to the bone, and have decided to give up and piss off. So yet again, I await the knife of the NHS and the longest wait in history to get a new elastic band fitted to once more propel me and the bike. I personally blame the pitch at Whytleafe, where this knee problem began....*cough* cough* excuse* !!! Anyways enough of that guff, lets get back to business and back to the point. 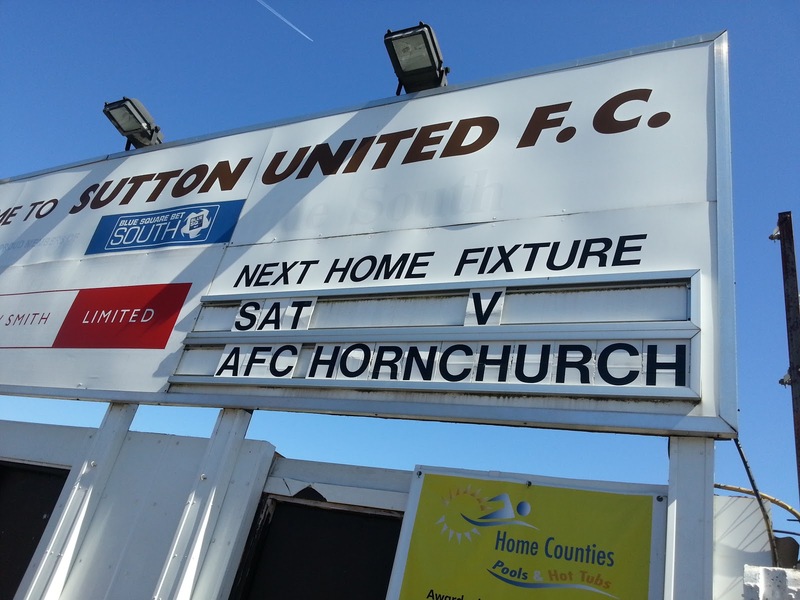 So today's fixture sees the return of the Hornchurch to the Lane. Now for those members of the Sutton Booze Cruise, and the other away fans will remember that this was A:- Marky N's first away day Booze Cruise of this Season, and B:- Us thinking we had the 3 points in the bag away at the 'Church, only to be denied by a lack of concentration within the final few moments to yet again leave Essex with just a poxy point Plus Dukey pulling a couple of birds on the tube ride home.....of the feathered variety. I'll say no more! 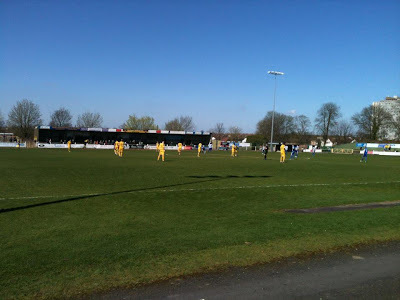 So back to today, the last Saturday home fixture this season, and what a beautiful day it was! With the Sun shining down on the Lane and the crowd looking good (although not as good as me), it was time to get down to business. We started out strong, and within the first 5 or so minutes, Marv Williams was put through with a lovely threaded ball, and with the Hornchurch keeper in no-mans land Marv went for the hero finish, instead of laying off the ball across the box on the deck for Faux waiting freely. Marv went for goal, but was denied. 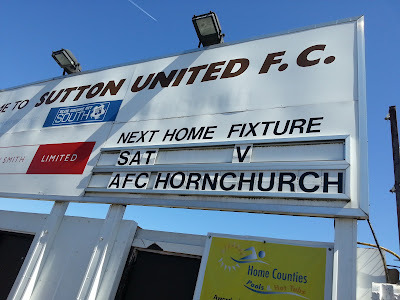 Hornchurch not sitting back, decided they wanted a piece of the action as well by testing the capability and the stickiness of Lovelocks gloves within the first 10 minutes. Jay Folkes was really impressing me within the first 15-20 mins, really working that right channel and taking on his man down the right flank. This young lad seems to get better and better the more he plays and his confidence is definitely growing with more and more game time-definitely a player for the future. With further attacking play from Sutton, this time down the left channel, the ball is cleared away for a U's corner from the Collingwood side. The ball delivered into the box, from Rents, heading in the direction of Stuart who makes space away from his marker and connects onto the ball with a free header, but again the opportunity saved by the Hornchurch keeper. 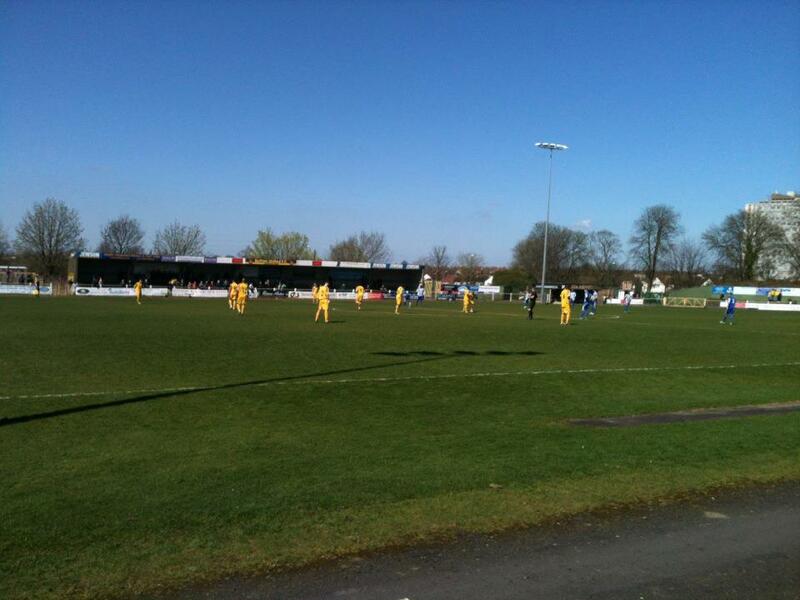 A further through ball from the middle of the park from Harry Beautyman plays Marv in. Marv breaks through the gap, using all his pace, and goes past the 'church full back, but with a slight bobble on the ball as his shot goes just over the bar. With Hornchurch on the attack again, Rents is left to deal with this, and brings the 'Church player down just outside the box and is duly shown a yellow for the poor challenge. Further work from Sutton in the middle of the park, bossing the midfield, plays Marv in once more, cleanly through again using his pace but is tripped by the rising foot of the 'Church 8, just as he is to break free for a goal scoring opportunity (from where I was standing it certainly was) only for the 'Church 8 to be shown a yellow. I quote Dos at half time talking about this challenge to the Ref as he went back down the tunnel.."If you've seen the lad play, you'd know that was a goal scoring opportunity!". Still we cracked on, and without standing on ceremony, we finally cracked the deadlock from a dreamy bit of passing and steady control. A neat one-two between Marv and Harry B. The ball played back into Marv in the box, he turned, with a bit of trickery picked his spot and fired a shot on goal. The 'Church keeper palmed it away down to his right and not able to get back up to his feet in time, Harry Beauts following up placed it in the back of the net with the inside of his right boot. So back at the tunnel we came for the second 45. The first 10 or so minutes, us looking a little tired, given the heat today I can't say its a bad thing. But with us being 1 up, we cracked away. So upping the tempo a notch. A further charging run from Marv down the right flank, with the ball knocked down to his feet, he burnt passed his marker, and a neat pass across the box to Beauts, Beauts teeing up another opportunity, only for the ball to bobble up in front of him, and for another goal scoring opportunity to be scrambled away. Round about now, Greek-after buying himself a tea, dropped a tenner out of his wallet onto the terrace and my god, I've never seen the Editor in Chief move so fast! Still got the pace has the old boy! A further chance for Hornchurch to level the scores came from a lack of concentration and touch and confusion between Stuart and Faux, which allowed the 'Church fella up front to intercept the ball, and pull the trigger back and fire a shot. Forcing Lovelock to dive down to his left, only for the shot to whisper Lovelocks left post. 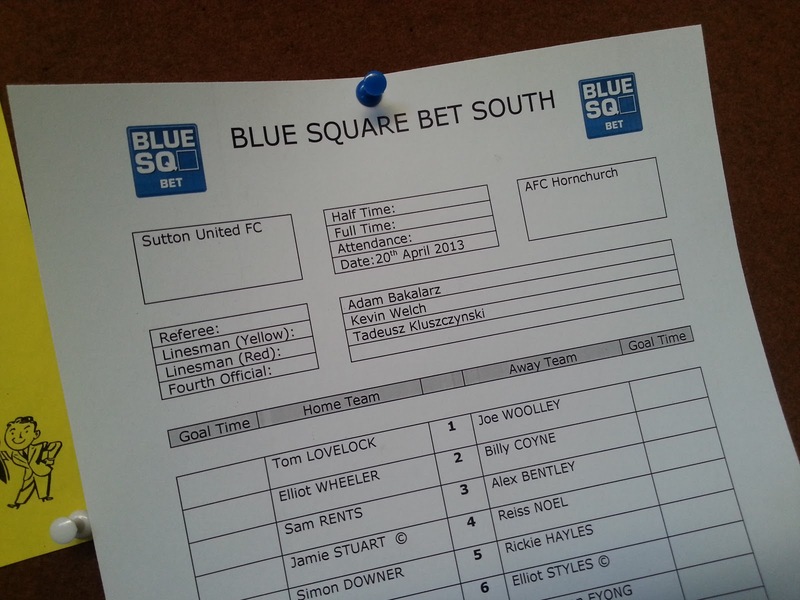 A change of personnel for Sutton- Folkes is replaced by Benjamin. A few minutes later following the change the 'Church take a long throw from the main stand side. 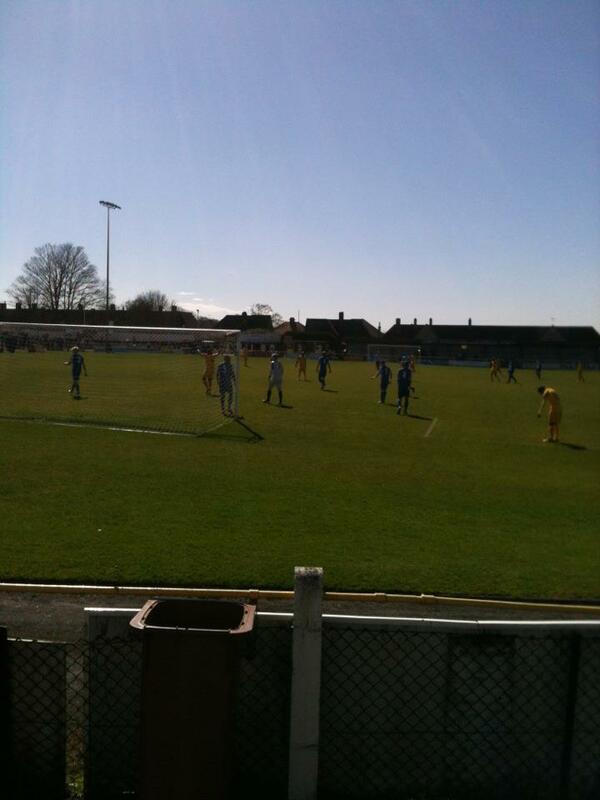 With the ball heading into the box and no-one calling for it or picking up, the ball goes over the Sutton back four. And with this a 'Church man is waiting in the wings out on the left, with a half bicycle type kick effort puts the ball past Lovelock to pull the game level. Despite this with our heads still up, Dundo picks up a loose ball/pass charges from the Sutton half straight down the middle of the park, only to yet again be taken out, and the ref not to allow the advantage, but to pull play back for a free kick. A further change in manpower for Sutton, as Rivs is replaced by Williamson. With more and more chances for Sutton coming pretty much one after the other and Dundo even hitting the post. The deadlock is finally broken by Rents latching onto a poor clearance, steaming down the left channel in from of the Main Stand. Rents delivers the ball into the box, along the Deck, and with Marv standing level-ish with the 'Church keeper, he slots the ball with great ease into the net. Not being satisfied with a one goal advantage. Williamson decides he wants to be in on the action, and with him, making his run down the right wing, in front of the shoebox. He takes a touch,and plays the ball onto his left, whilst turning past the 'Church back 3 and looks up, and sees the 'Church keeper coming off his line and without hesitation, slots the ball past the onrushing keeper. So after today's game, it was of course our duty to celebrate the victory in the club bar. Of course a rather large number of Bulmers and other drinks were knocked back by the pint load. 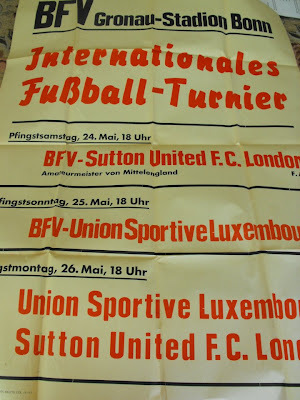 We continued to drink on through the night, until I suddenly remembered that the '63 Amateur Cup reunion party was taking place in the VP Lounge next door. So we did what we do best, we had to have a little sneaky look and crash the party. 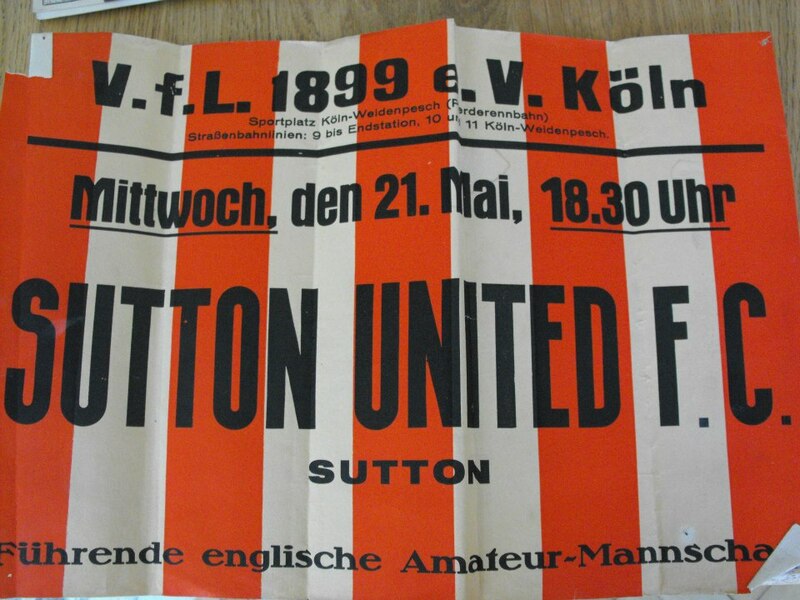 Seeing as currently at Gandermonium we are attempting to get as much History of the club documented we are actually kind of educated in one way or another. So into the VP lounge we crept and we layed down a little bit of History onto the table for the players of that era to enjoy. 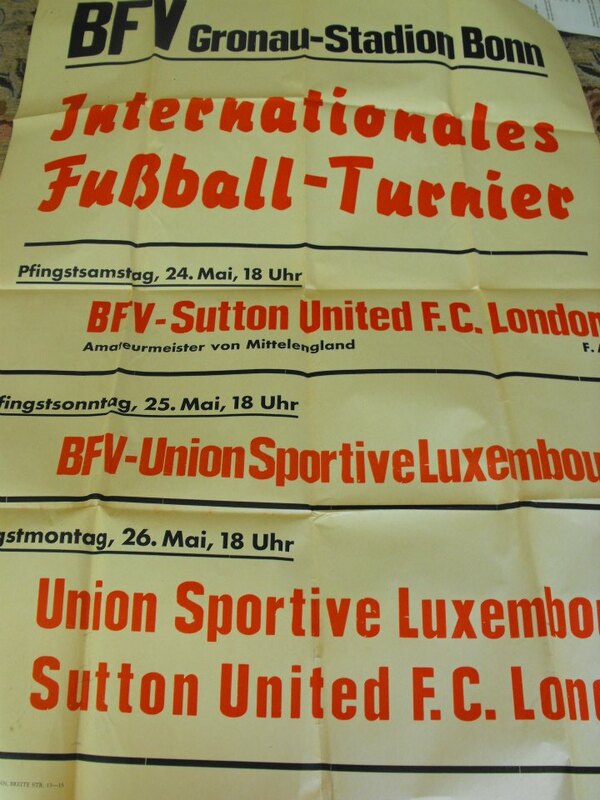 SUFC v Bonn FV & US Luxembourg in Bonn. Circa '63. 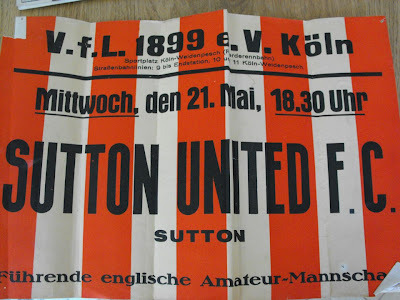 Plus with Frakey on hand and a 1 or 2 of the players involved in the Germany tour (Norman Dearlove) in attendance, our minds were given an overload of historical information we didn't know, which of course required further pints to help us digest it. So after a few more beers in the clubhouse. We decided to head into town and set up camp, as per the norm, at the Grapes in Sutton. 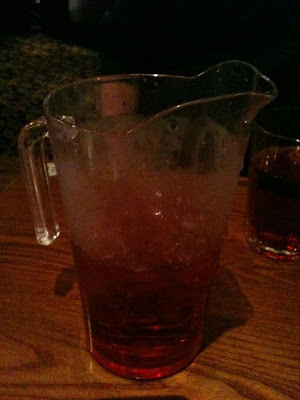 So as our thirst continued on into the night, we again ordered further beverages from the bar keep and also some chow, to settle the stomachs. Light in numbers at this point, just myself, Duke, Editor in Chief, and Mr X, we decided to continue drinking into the night, mostly with a large volume of "WooWoo". The last time I ordered something called a 'Woo Woo', it wasn't the liquid type- but I shan't continue that story, as it's staying locked away in the Juan 'vault'. So with woo woo in hand myself and Duke had to amuse ourselves for about an hour and half, whilst the Editor in Chief and Mr X discussed their ever growing rage (which later turned into a love for one another) of the current split/divide in the support and the location of the various supporter group throughout the terraces, along with the current atmosphere at GGL. I'm not going to go into any more depth than that.....mainly as I had to listen to it last night, and well it nearly dropped me into a deep sleep, I wouldn't want to re-live it again. So that's were the night ended, on a good note as always. So I off I went, jumped on my bike (beer numbing the knee pain) and cycled off home up the ''mad mile'' back to Juan Towers. So again we have seen the beacon light from Mr (I now must remain anonymous to the world) X. He has decided that yet again this year after the last Blue Square South, and Surrey Senior Cup game has been played on the loyal and royal turf of Gander Green Lane, that us brave men, and die-hard supporters of the 'firm' and club must once again unite as one to endure the pain and post match suffering from aching muscles & bonesof another Supporters Vs Colts Managers game on Friday the 26th of April, Kick off around the half seven mark. Whoever planned it the night before Bath Away though needs a good kick up the arse, still I guess that means only one thing.....we'll just have to drink to numb the pain eh? 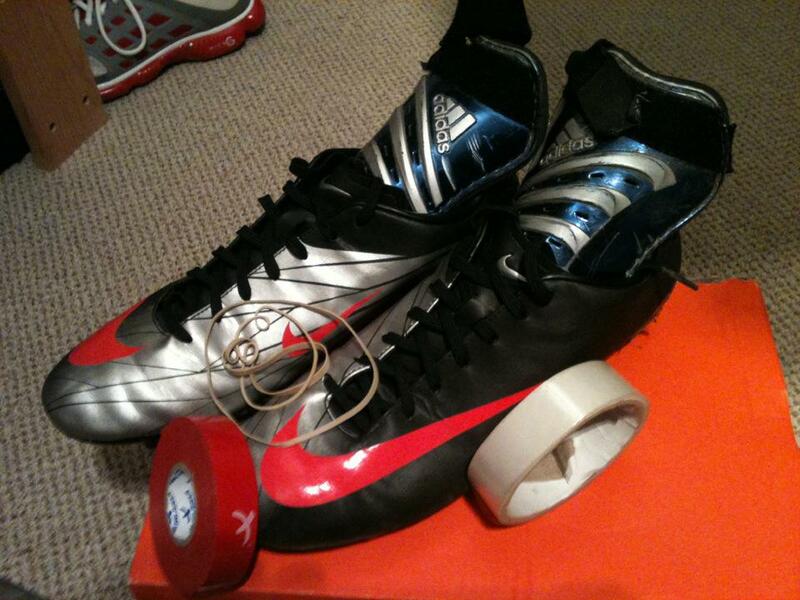 Finely honed, athletic specimens. None of which are in this pic. So with the beacon burning brightly to the masses in the sky. I answered the call and found the trusty Nike boots, red shin pad gaffa tape, Adidas size 7 shin pads and again prepared myself for the challenge. ''What about your dodgy limpy knee Juan?'' I hear you cry, well don't you worry about that, I've prepared for the occasion.....6 rolls of Gaffa Tape, two elastic bands, one roll of sticky tape, and a partridge in a pear tree, all for the sum of £6 pounds from the pound shop! That should hold it, no problem!! Shouldn't these be hanging up somewhere Juan?? So with myself the Duke and the Editor in chief ready for it......god help us if SUFC TV turn up on the night to film the highlights though, especially if they capture any of Dukes rather 'robust' challenges. That'll get it certified a snuff movie or summat.